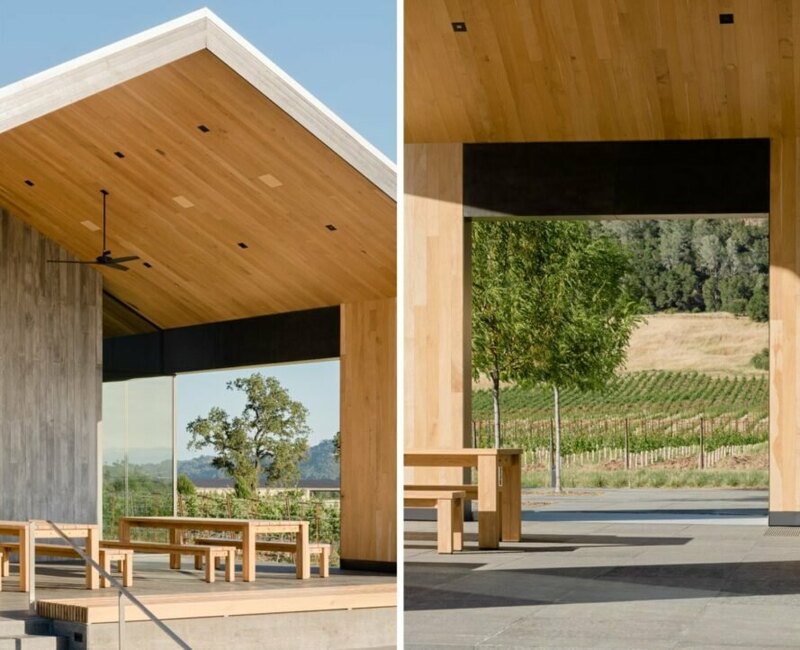 San Francisco-based firm Piechota Architecture has designed what is being called the most sustainable winery in Sonoma Valley. 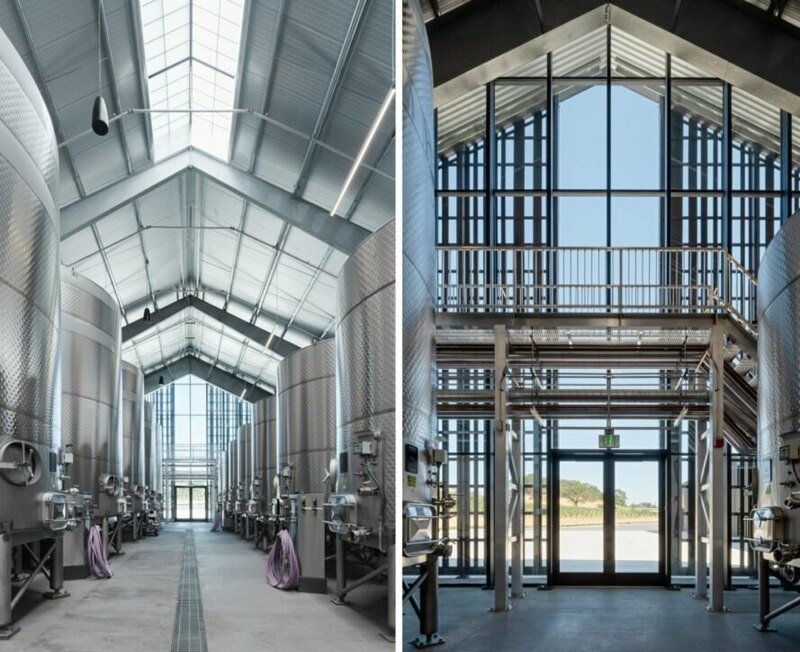 Tucked into the rolling hills of Alexander Valley, the solar-powered Silver Oak winery design, which was made with repurposed materials, has already earned a LEED-Platinum certification and is on track to become the one of the world’s most sustainable wineries. 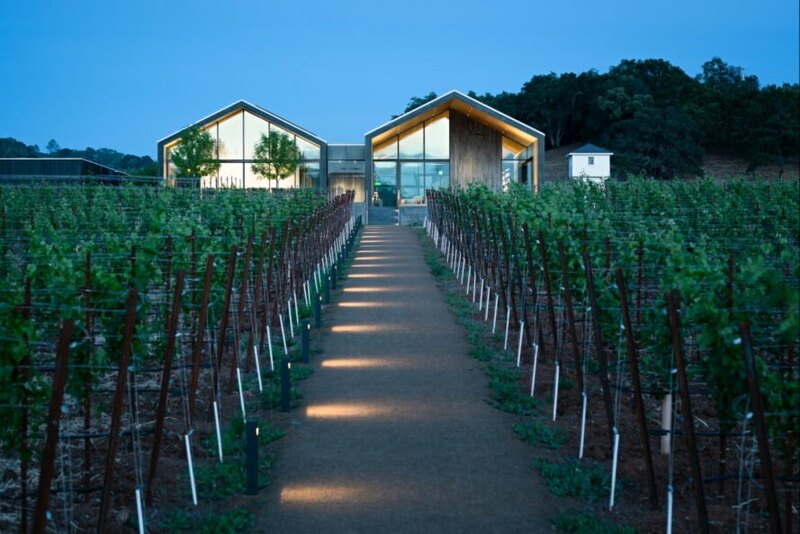 The family-owned Silver Oak Cellars winery was established in 1972 and has since become world-renowned for its award-winning Cabernet Sauvignon. The winery’s first location is located in the Napa Valley town of Oakville. 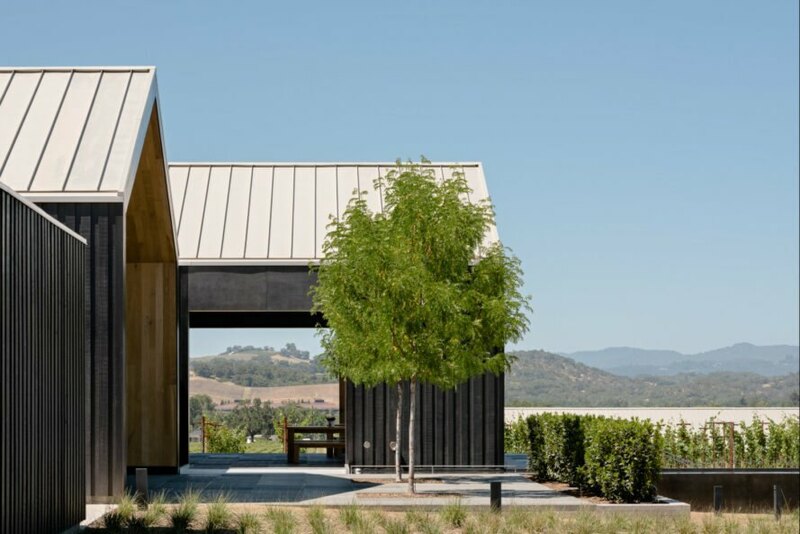 The company’s second winery, designed by Daniel Piechota, is located on an expansive 113-acre estate and 75 acres of prime Cabernet Sauvignon vineyards in Alexander Valley. 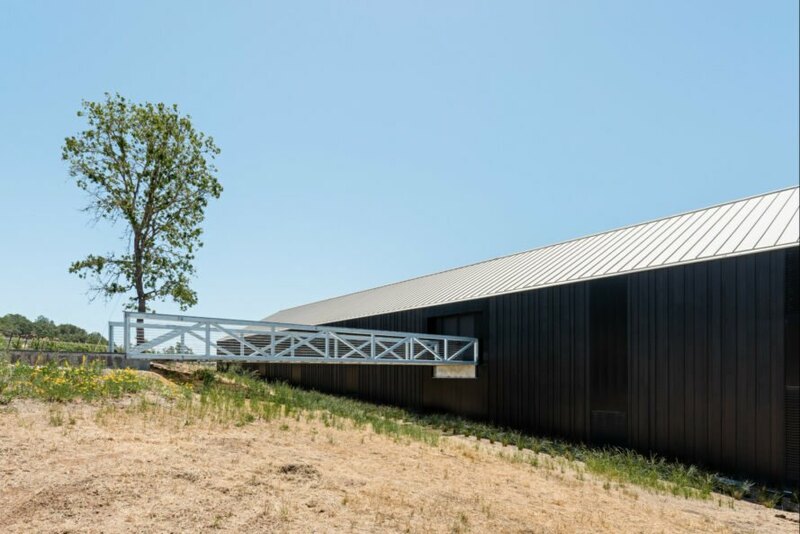 With its low-lying gabled farmhouse silhouette, the winery appears low-key from afar; however, behind the clean lines, charred timber cladding and minimalist forms lies a powerhouse of sustainability. According to the architects, the design of the winery applies the concept of “reduce, reuse, recycle” through various sustainable features. For energy generation, the winery has an extended roof installed with more than 2,500 solar panels, which generate 100 percent of the building’s energy needs. 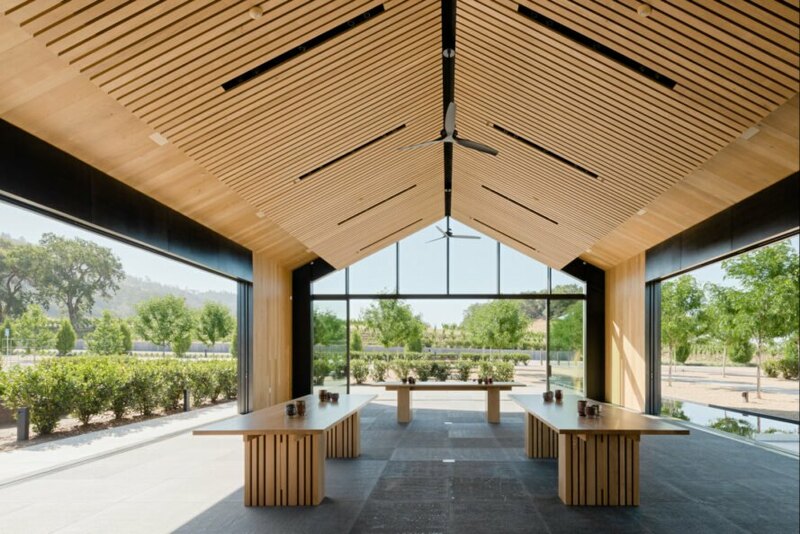 The design uses plenty of recycled materials, but the reclaimed wood was specifically chosen to pay homage to the area’s wine-making industry. The winery’s exterior is clad in wood panels taken from 1930s wine tanks from Cherokee Winery, one of the valley’s pioneers of wine-making. Additionally, the design incorporated charred panels recovered from Middletown trees that were naturally felled during a fire in the valley in 2015. Now, the blacked trunks and panels have been given new life as a modern, sleek facade for the winery. Inside, visitors are met with a large entry staircase, also built out of reclaimed wood from oak wine barrels with red wine stains that were intentionally left visible. The rest of the welcoming interior is a light-filled space filled with steel and wood features. Visitors will be able to take part in wine tasting in the winery’s tasting room, which is nearly net-zero water. With a calming reflective pool, native vegetation and open-air seating, this area is the heart of the design. Created to mimic the local barn vernacular, the gabled roof and large cutouts provide beautiful framed views of the rolling hillside that surrounds the estate. Of course, as with every winery, water plays an essential role in Silver Oak’s production. 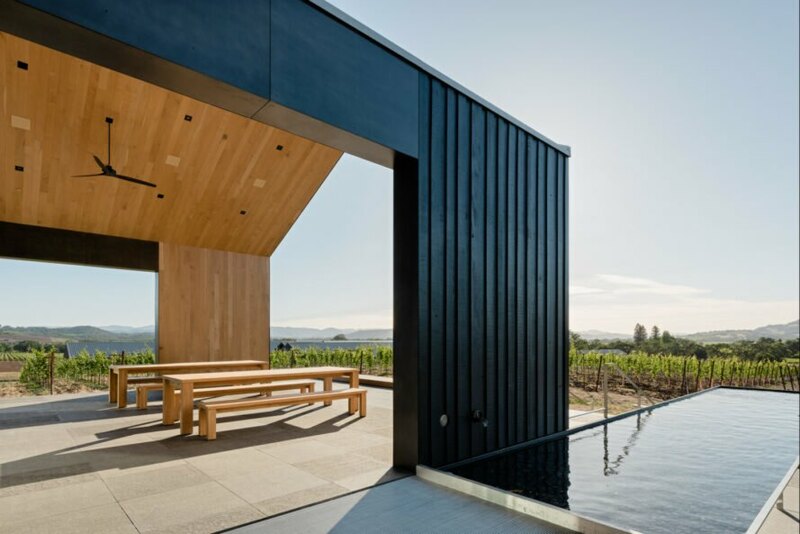 To reduce waste, the winery was installed with a state-of-the-art water reclamation system, including a membrane bioreactor that treats and filters water from the cellar to provide potable water. Rainwater is harvested and collected to be used in the vineyard’s irrigation. 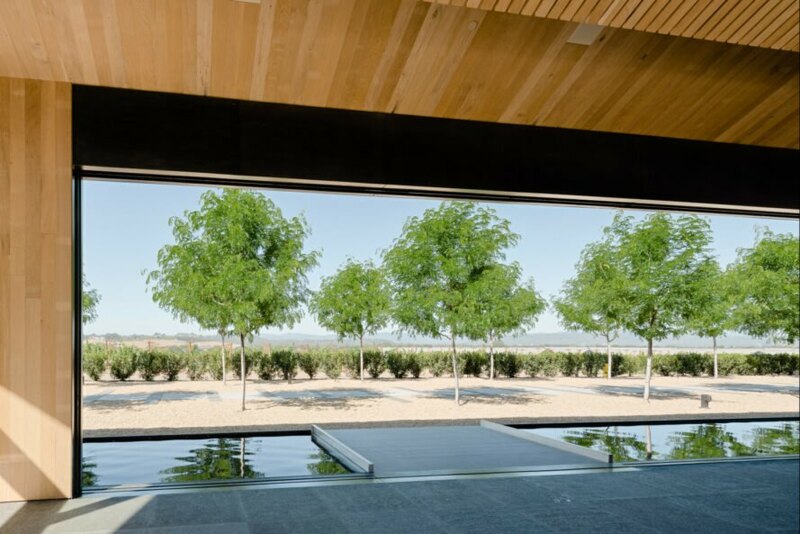 The Silver Oak Cellars winery was designed by Piechota Architecture to be one of the world's most sustainable wineries. 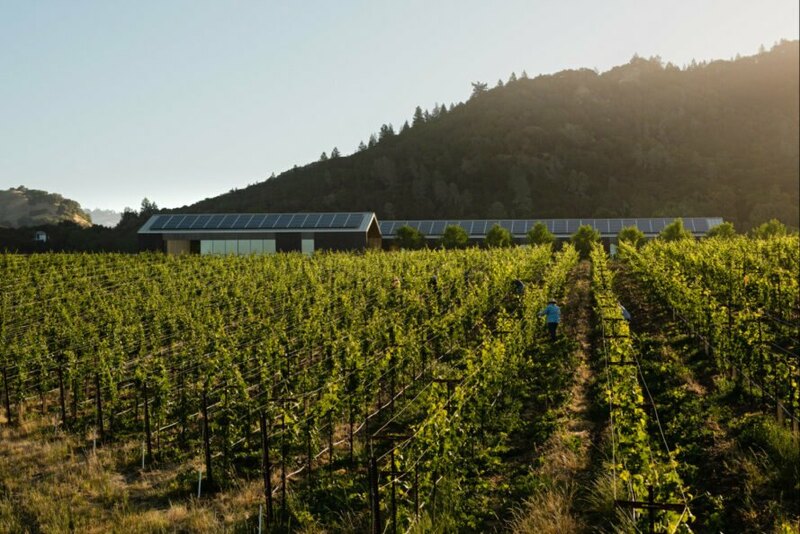 Designed by Daniel Piechota, the solar-powered Silver Oak winery is has been called the most sustainable winery in Sonoma Valley. 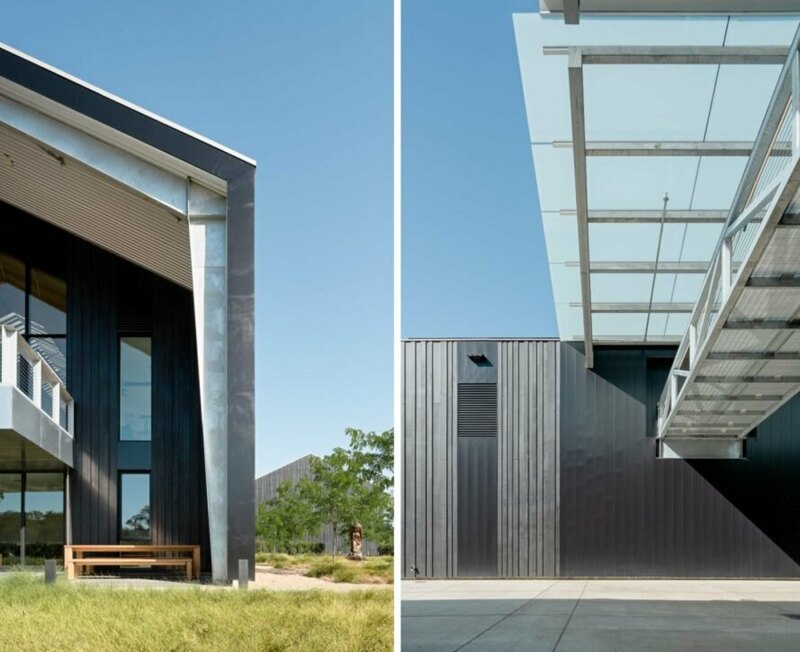 Made of reclaimed wood and equipped with solar panels, the winery has already earned a LEED-Platinum certification. The design is marked by an extended building with a gabled roof. The open-air tasting room boasts stunning views of the rolling landscape. The vegetation around the winery was left in its natural state. Black panels contrast the light wood hues on the interior. The winery's design pays homage to the local barn vernacular. The charred timber cladding was made out of reclaimed trees that were burned in a fire years ago. The wine production system operates with a nearly net-zero water installation. The interior spaces include intense lighting strategies. 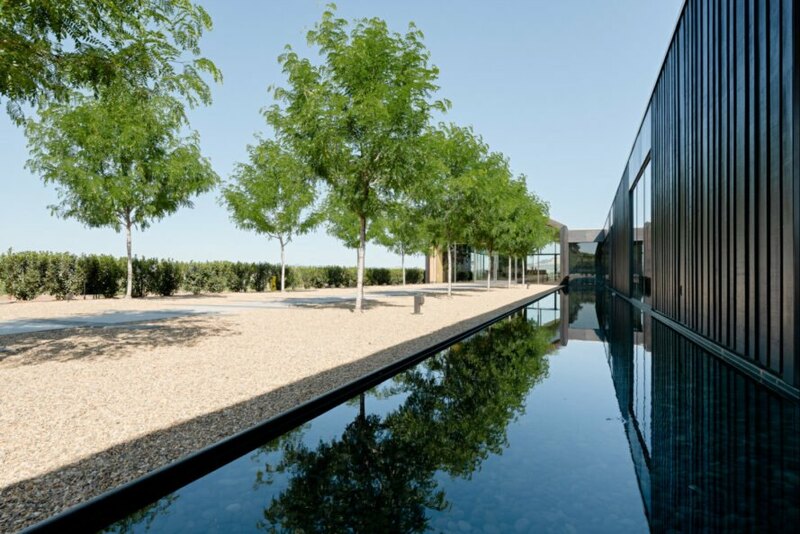 A soothing reflecting pool surrounds the tasting area. The water feature, along with the soaring trees, provides a nature-inspired space. 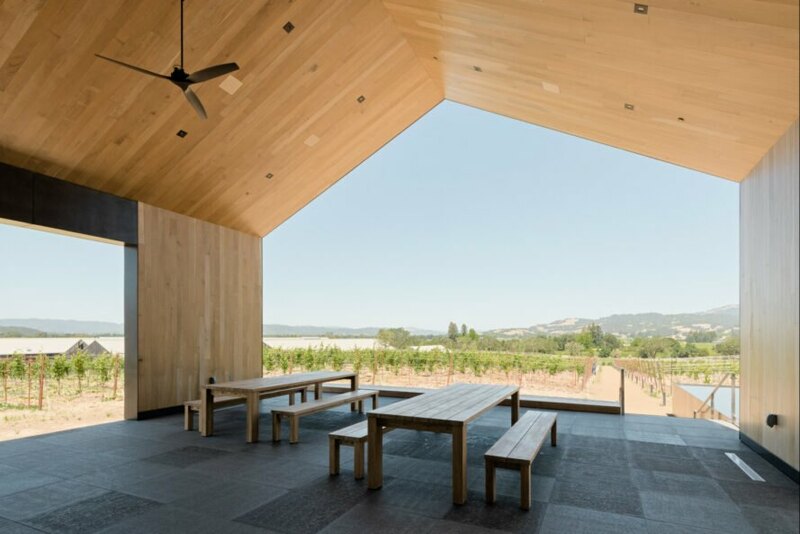 The tasting room offers a covered space to take in the amazing views of the landscape. Clean lines and floor-to-ceiling windows create a modern atmosphere. The winery is tucked into the rolling hills of Alexander Valley.